Possibly the best drying towel I've used! 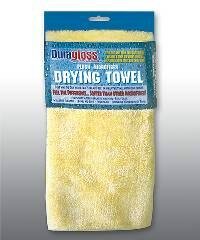 This is the best microfibre towel I have evr seen or used. I cna't really believe it is mircrofibre ! I've been using one for a couple of months now and the finish you get with this is even more un-beleivable than I ever thought possible and it is wahes up brilliantly after use. It just keeps getting better and better ! I am going to order another couple with my next order ! this is almost too good for use on cars, I have never seen anything like it, Im have had to buy a set for my wifes car aswell. Brilliant, our cars seem to polish up shinier just by using these cloths with the Duragloss products.